Jose Mourinho is confident David de Gea will sign a new contract — despite the goalkeeper reportedly holding out for a £350-000-a-week deal to put him on par with the likes of Paul Pogba and Alexis Sanchez. The goalkeeper will be a free agent next summer and, as reported by Sportsmail last month, United were willing to make him the Premier League's best paid stopper with a new, £200,000-a-week-plus, long-term deal. But De Gea has still to put pen to paper, with The Sun claiming the club are refusing to bend easily to the player's new salary demands. Mourinho has moved to reassure fans, however, claiming a deal to keep the player at Old Trafford should not be far off. 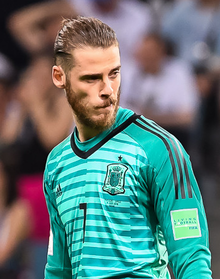 De Gea was long linked with a move to Real Madrid and only a dodgy fax machine cost him a return to the Spanish capital in 2015.